"Guernica 2016" is a reimagining of Pablo Picasso's anti-war painting as an atmospheric interactive environment. The player takes control of a modern-day predator drone as it hovers over a blasted urban landscape, rendered in the jagged, black-and-white style of Picasso's painting. 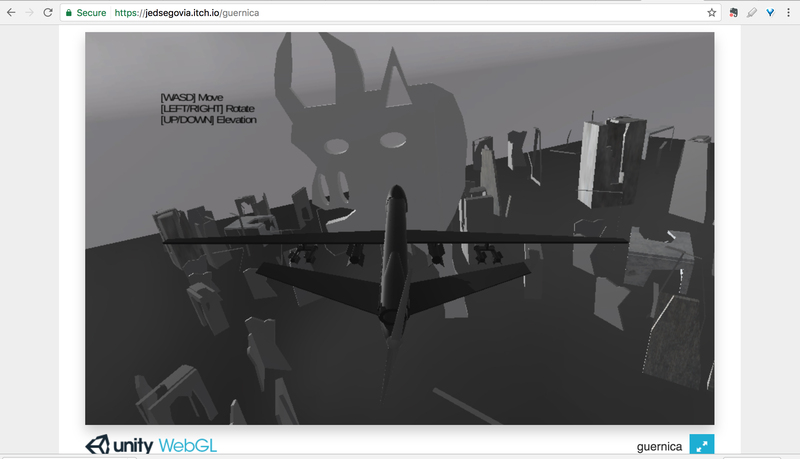 "Guernica 2016" invites users to explore the devastated skyline and contemplate the desolation wrought by conflict. The player will even see figures from the original painting rendered in 3D and included in the skyline. The drone can fly into the ruins and knock them over. The drone can also collide with the Guernica figures, causing them to scream. The 3D assets were rendered in Maya and the environment was built in Unity. Royalty-free sound effects from various online sources.